This play baseball quiz has 10 questions, so step up to the plate and test your baseball IQ. See how well you really know the game by taking this engaging, often tongue-in-cheek baseball vocabulary quiz for passionate players and fans. Batter up! 1) What is the baseball term for a breaking fastball? 2) What is baseball lingo for a pitched ball that breaks sharply, such as with a curveball? 3) What is the baseball jargon used for the following pitch after a full count is established? This pitch will benefit either the batter or pitcher at this point. 4) During a baseball game, what is the term used when a relief pitcher is placed in the game before the closer? 5) What is the baseball lingo used to describe a fielder who scoops the ball and runs with it? 6) In baseball, what does the term, Outside Corner refer to? A. A ball pitched to the edge of home plate, thus away from the batter. 7) The baseball players’ action known as a Chase After refers to? B. They attempt to hit a pitch way outside of the strike zone. 8) What is a Wheelhouse in baseball games? A. Power hitter's favorite spot to hit the ball to achieve the best results. B. Another term for the bullpen. C. Another term for the on deck circle. 9) What is a Hot Corner in baseball terms? A. Term for sliding behind a bag instead of directly at it to avoid a close tag. B. Term for third base. C. Corner of the strike zone that pitchers usually throw the high heat. 10) What is a Circus Catch in baseball terms? A. Catch made by a fan on either a home run or foul ball hit into the stands. B. Catch that is first juggled. C. Physically impressive and often acrobatic catch by a fielder. Answers to Play Baseball Quiz. Did you score a grand slam? 1) C. Cutter: term for a breaking fastball. 2) A. Drop off the Table: term for a pitched ball that breaks sharply. 3) C. Payoff Pitch: baseball jargon for the following pitch after a full count is established. 4) C. Setup Man: term for a relief pitcher placed in the game before the closer. 5) C. Shoestring Catch: term for fielder who scoops the ball and runs with it. 6) A. Outside Corner: pitched to the edge of home plate, thus away from the batter. 7) B. Chase After: baseball player attempting to hit a pitch way outside of the strike zone. 8) A. Wheelhouse: power hitter’s favorite spot to hit the ball to achieve the best results. 10) C. Circus Catch: physically impressive and often acrobatic catch by a fielder.. 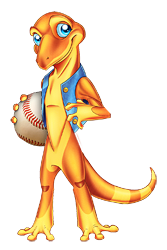 Along with Play Baseball Quiz, there is a 3-part Baseball Glossary at gamerisms.